If you're using the webmail interface for Gmail, YogaTrail emails are probably ending up in your "Promotions" folder (because our emails are styled with colors, or often contain buttons and images). That means you could very easily miss the email, which can be a big problem when we send you important notifications... like inquiries about your upcoming event, or when a yogi wants to take private lessons with you, etc. — you get the idea. The best way to ensure our emails appear in your Primary tab is to click and hold on a YogaTrail email to drag it from the Promotions tab over to the Primary tab. Please note that "starring" a message simply moves that message to the Primary tab, but not future ones from the same sender. It doesn't provide a permanent solution, so don't bother with "starring" a YogaTrail message (unless it's one of your favorite emails of all time)! Near the bottom of the advanced filter window, you'll see a Categorize as section with a drop-down menu where you can select the tab you want. 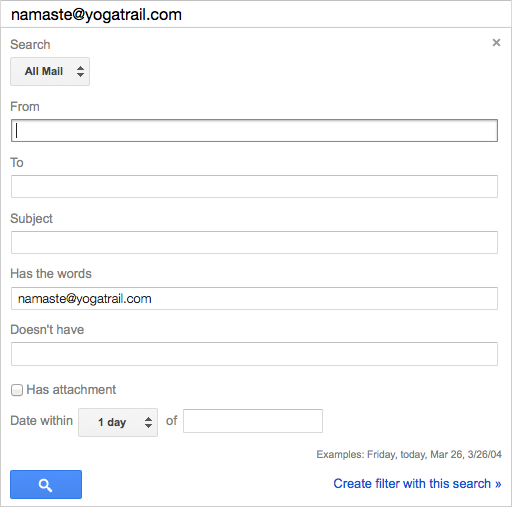 Once you've created the filter, all the emails from YogaTrail that are currently in your inbox will be moved to the Primary tab, and any new ones will be delivered directly to the Primary tab. Note: When using the Search and Filter option, we'd also recommend checking off the box for Never send it to Spam - which will help to ensure deliverability of email.